The Gorkhas(Gurkhas, Gorkhalis, Gurkhalis) are considered to be the most fierce soldiers in the world and are respected even by their enemies. Field Marshal Sam Manekshaw once said, "If a man says he is not afraid of dying, he is either lying or he is a Gorkha." In this article we will have a brief look a the history of Gorkhas and as to what makes them so special. Gorkhas are the soldiers of Nepalese nationality and ethnic Nepali people of India recruited for the Indian Army, British Army, Nepalese Army, Gurkha Contingent Singapore, Gurkha Reserve Unit Brunei, UN peacekeeping force and other war zones around the world. In 1949, the spelling of 'Gurkha' in the Indian Army was changed to the traditional 'Gorkha'. When India became a republic in 1950, all royal titles associated with the Indian Gorkha regiments were dropped. Their war cry is "Jai Mahakali, Ayo Gorkhali! (Hail goddess Kali The Gorkhas are here)"
Their motto is "Kayar Hunu Bhanda Marnu Ramro (Better to die than live like a coward)"
Every Gorkha soldier carries a special type of knife called Khukuri and they are very skilled in fighting with it. 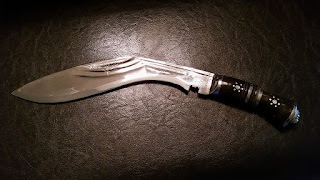 The Khukuri is the traditional knife of Nepalese soldiers and has been used by them since their existence. Once drawn, this 18-inch curved knife is said to need to have tasted blood and if the Gorkha had not managed to draw the blood of his enemy, he would have to cut himself before sheathing the weapon. Evidence of this custom was provided by a Gorkha soldier fighting in Afghanistan in 2011. In order to provide DNA evidence of the death of a Taliban commander, the Gorkha beheaded the insurgent and carried the body part back to his base in a bag. After the Anglo-Nepalese War (1814-16), also known as the Gorkha War, the Britishers were so impressed by the fighting skills of the Gorkhas that they decided to raise a Gorkha regiment of their own for the British Indian Army. Major General Sir David Ochterlony raised the first regiment of Gorkhas. It was then called the Nasiri regiment. This regiment was later renamed as the 1st King George's Own Gurkha Rifles, and first saw action at the Malaun fort under Lieutenant Lawtie. They helped in the expansion of the British East India Company throughout the subcontinent. The Gorkhas took part in the Gurkha-Sikh War, Anglo-Sikh wars, Afghan wars and also in suppressing the Indian Rebellion of 1857. They also fought both the World Wars and played a very important role in most of the battles they fought. Throughout these years, the British kept raising more and more Gorkha regiments. A total of 10 Gorkha regiments were raised by 1947. After India's independence, India, Nepal and Britain signed a Tripartite Agreement. According to this agreement the following six Gorkha regiments joined the Indian Army. Many soldiers from the 7th and 10th Gurkha Rifles refused to join the British Army due to which the Indian Army had to raise 11 Gorkha Rifles in 1948 to accommodate those soldiers. So now there are 7 Gorkha regiments in the Indian Army and 39 batallions are serving in these 7 regiments. The Regimental Insignia of all the Gorkha Rifles Regiments consists of a pair of crossed khukuris. So far these 7 Gorkha regiments of the Indian Army have won 3 Param Vir Chakras, 30 Maha Vir Chakras and 99 Vir Chakras. 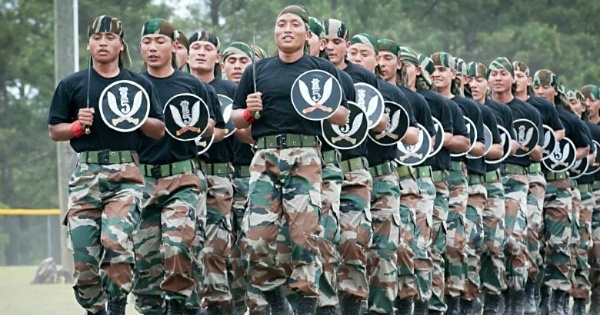 Under the Indian Army, Gorkhas have served in Bangladesh, Sri Lanka, Siachen, and in the UN peacekeeping missions in Lebanon, Sudan and Sierra Leone. The first ever Ashok Chakra of independent India was won on 15 Semptember 1948 by Naik Nar Bahadur Thapa of the 5th batallion of the 5 Gorkha Rifles (Frontier Force) in the 1948 Annexation of Hyderabad(Operation Polo). Field Marshal Sam Manekshaw served in the 8 Gorkha Rifles after independence. The present Chief of the Army Staff, General Bipin Rawat belongs to the 11 Gorkha Rifles. The previous Chief of the Army Staff, General Dalbir Singh Suhag(retired) belonged to the 5 Gorkha Rifles. thRadical :Short notes for Competitive exams: The legacy of Gorkhas - The most feared soldiers in the world!